World Health Organization Director General Tedros Adhanom Ghebreyesus (Dr Tedros) today explained details of fundamental changes being set in motion at the UN agency, including greater impact, increased staff work and training at the country level, producing ‘world class’ work, more transparency, and digital health and innovation. In his opening remarks to the WHO Executive Board, he listed recent accomplishments and devoted significant attention to staffing issues at a time when unconfirmed reports of alleged misconduct have been circulating. The WHO Executive Board is holding its annual winter meeting from 24 January to 1 February. A copy of Dr Tedros’ remarks are available on the WHO website here. Dr Tedros provided details of fundamental changes set in motion at the UN agency. Early in his remarks he highlighted the work WHO staff are doing in the field and said he spent New Year’s in the “epicentre” of the area affected by Ebola in the Democratic Republic of the Congo (DRC) in order to dispel myths and show what it means to be on the front lines. He said he helped carry the stretcher of a worker there who had been beaten when he tried to help in a village. He mentioned the importance of the “triple billion” initiatives in the next five years, 1 billion more people benefitting from universal health coverage, 1 billion better protected from health emergencies, and 1 billion enjoying better health and well-being. He described many accomplishments, such as numerous regional and country level efforts, as well as new campaigns with partners addressing a range of problems and diseases. Among the many other items mentioned were a special initiative to expand access to quality and affordable care for mental health in 12 countries for 100 million people, the relaunch of the Global Health Observatory, and leadership on the UN High-Level Meeting on Universal Health Coverage at the UN General Assembly next September. On the major transformation, he said, it is “not about tinkering at the edges.” It is closely aligned with the broader UN reforms being led by the UN secretary general. And at the December “global management meeting” in Nairobi, they focused on the four major shifts: measurable impact at country level; relevance in every country; leadership and world-class work; and innovation. Another big emphasis of the transformation is on innovation and digital health. These are described in a story in Intellectual Property Watch (IPW, WHO, 24 January 2019). Separately, some Board member states today asked for more transparency in the processes of the WHO, noting for instance that they had not received any updates from the secretariat since the last board meeting in June 2018. A major closed-door WHO management meeting was held recently in Nairobi to unveil some of the anticipated changes in the “transformation” of the organisation. Dr Tedros agreed to share a written update to the Board between meetings during the year and in general to be more transparent. 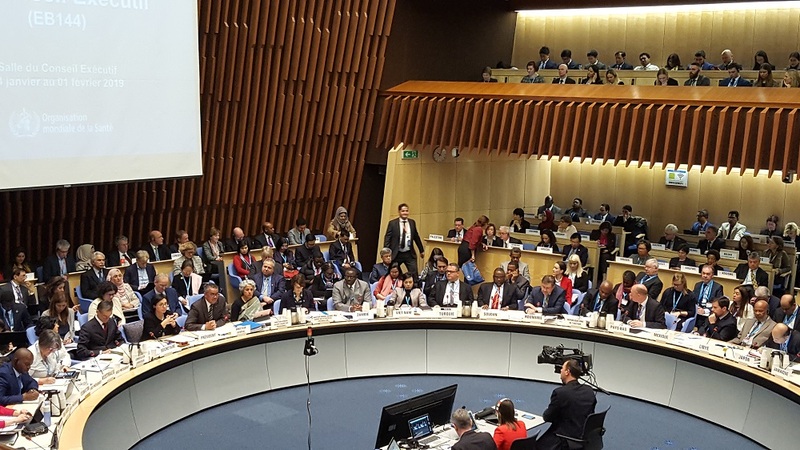 Tedros used significant time in his speech to focus on concerns about harassment and misconduct in the organisation, and about strengthening, diversifying inspiring staff. Regarding an email containing allegations of misconduct by various WHO staff received by the WHO in recent weeks and publicly distributed, he insisted the agency is committed to “the presumption of innocence, to our duty of care for all staff, and due process to find the truth.” He added that WHO leadership wants to know the truth “more than anybody” and that it would “do anything” to learn the truth.